Mounted inside unit above seat for easy access. • Filled with 250 biodegradable half-fold sheets and are refilled as needed. • Wide rectangular opening to easily release one HEADLINER sheet at a time. • HEADLINERS are made from a quick dissolving tissue which is biodegradable and flushable. • Won't clog plumbing under normal use. • HEADLINERS cover the complete toilet seat. • Protects against germs and bacteria which can cause illness. • The HEADLINER sheet's extra flap will drop into the toilette on its own when flushed so the user never has to touch the seat. • Available for day, week or monthly rental. • Maintained 100% by CALLAHEAD. Construction job sites. • Special events (parties, weddings, school functions, marathons, charity events, sporting events, concerts, festivals, etc.) • Protects children in playgrounds. • Protects the elders, handicapped and others who may need special assistance when using a public restroom. • Provides a sanitary visit to any public restroom. • One (1) HEADLINER dispenser is recommended for each portable toilette. • A sanitary solution to compliment a CALLAHEAD portable toilette. Reduces cleaning frequency. • Promotes good toilette habits. • No physical contact with a used toilette seat. • Toilette seat covers work as an effective barrier and provide restroom users with real protection and peace of mind. • Cleaner toilettes have been proven by those using HEADLINERS. • Excellent for handicapped, elderly, pregnant women and children who must use the toilette seat. • Assurance that the seat is clean and free from any infectious stain. • It's an established fact that people are afraid to sit on public toilette seats. • Hand towels and toilette tissue used to line the seats provide little protection, clog the plumbing, create a mess and increases the cost of supplies. • Sharing a toilette seat is like sharing your toothbrush or bath towel with strangers: it's a risk people prefer not to take. • If you manage a business with a toilette facility, you are responsible for the health and well-being of your employees, and toilette seat covers will help reduce the risk of employee illnesses and sick leave. • The alternative to using flushable toilette seat covers is lining the seat with layers and layers of toilette paper or hand towels, which more often that not, are left on the floor leaving the restroom untidy and unsanitary. 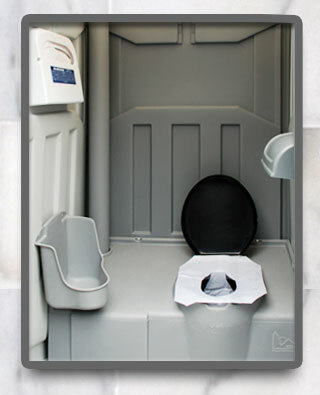 • Have an immediate impact on both the appearance of your portable restroom and health of the people who use them. • People want sanitary public restrooms and HEADLINERS will promote use by otherwise skeptical users. 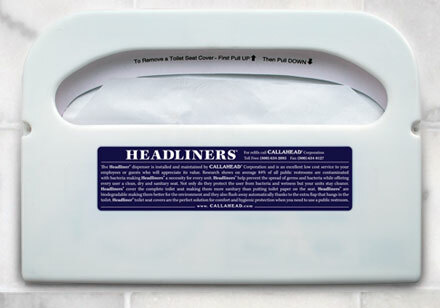 • HEADLINERS are a "must have" for every portable restroom. CALLAHEAD Corp. is proud to be the first company in our industry to offer our clients HEADLINERS for hygienic protection when using our portable restrooms. Our HEADLINERS dispenser is installed in each unit filled with 250 biodegradable toilette seat covers which is maintained 100% by CALLAHEAD. Research shows over 84% of all public restrooms are contaminated with bacteria, making HEADLINERS a necessity for every portable toilette. HEADLINERS will help prevent the spread of germs and bacteria while offering every user a clean, dry and sanitary seat. HEADLINERS cover the complete toilette seat, making it more sanitary for every user and they are biodegradable, making them better for the environment. With an extra flap that drops down into the toilette, the HEADLINERS sheet will flush down on its own, so the user never has to touch the seat. HEADLINERS promote use by otherwise skeptical users of public restrooms, especially women, children and those who need special assistance. Not only do HEADLINERS protect against germs and bacteria, but your unit will also stay cleaner longer. CALLAHEAD's HEADLINERS are an excellent service for your employees or guests, who will appreciate its value and a "must have" for every job site and special event. CALLAHEAD Corp. has, and will, continue to research new ideas and products, to develop a higher level of equipment and service to our clients. The CALLAHEAD brand has surpassed all others in our industry with our innovative equipment and superior service, making us undoubtedly the greatest portable sanitation company in the country. The HeadLiner Toilet Seat Cover for Porta Potty/Portable Toilets.